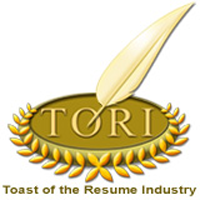 Each year CDI hosts the Toast of the Resume Industry (TORI) awards to identify and recognize the top resume writers around the world in various areas of specialty. In 2013 our categories included first, second, and third place awards for best resume in: executive, IT, new graduate, creative layout, re-entry, sales, healcare/medical, and international. There was also a category for cover letters.